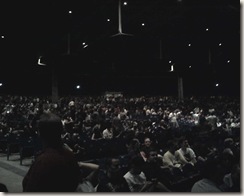 Dan and I arrived at Cricket Wireless Pavilion with about an hour to spare. We parked, and then had to walk around to the opposite side of the venue to pick up our tickets at Will Call. Once inside, Dan and I made a few stops and then made our way to our seats. It always feels a little strange to keep walking closer and closer to the stage, as I'm used to sitting farther away. 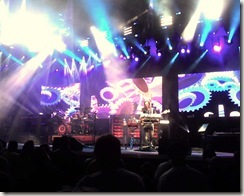 But tonight we had fifth row seats, right in front of Geddy. Two women are sitting on Geddy's side of the stage. They have their own monitor, and are holding radio station signs. Dan said they had a contest at the local radio station for a meet and greet with Rush. I guess the private seats on the stage were part of the deal. Dan spots Randy Johnson backstage, perusing the drum kit (behind the curtain), talking to the crew. I tell Dan that Randy is friends with the band and is a drummer himself. 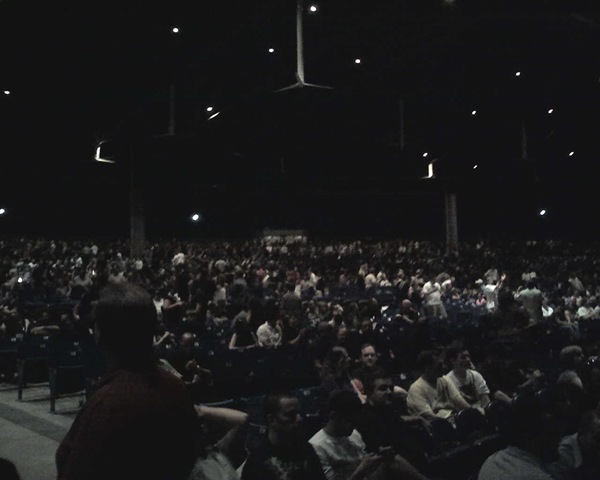 In general, there are more women at Rush shows these days. I bet this seems a little strange to the band. Lots of kids at the show. Looking around, I can see 4 with their parents in my immediate vicinity. One is sitting next to me. Once the show starts, Alex doesn't hold the note in Limelight. I'm glad they dropped the whole Alex-waits-for-Geddy-who-is-eating-chicken-backstage shtick. Everyone I talked to on the last leg thought Rush was making a mistake -- that Geddy really was late to the stage. I'm getting used to the new arrangement of Digital Man now. The end of the song rocks. It's nice to hear Ghost of a Chance again. The band has changed the arrangement quite a bit. However, I'm not sure switching out Entre Nous with Ghost was a good idea, especially because Mission, another mid-temp song, follows. Neil is especially into the show tonight. He's hitting hard, grimacing. I can tell when Neil is into it, even from far away. 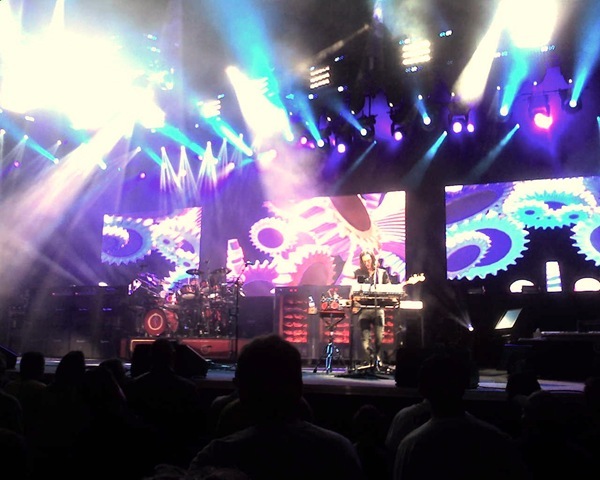 Geddy is right in front of us much of the time. His bass playing is astonishing at close range. I noticed that sings his bass parts, too. Geddy: "We have to drink lots of water cause we're from Canada. We're used to shoveling snow." Security cracks down on everyone taking pictures. Right before intermission, Geddy says, "We need to take a break. As you can see, we're no spring chickens." I also see that the ceiling fans are still (last time they were spinning like airplane props in August heat). That's because a cool breeze is blowing. Perfect night for a concert. The new lead-in to Set 2 is hilarious: "Harry Satchel in 'What's that Smell?'" In Subdivisions, Neil has problems with his hi-hat clutch (the piece that locks the top hi-hat to the rod, so that he can open and close it with the pedal). Lorne Wheaton, his drum tech, does a quick fix and then in the intro to Natural Science does more work as Neil takes a break. Also in Natural Science in the Tidepools section, Geddy is clearly having problems with his in-ear monitors. He keeps motioning for the soundman to fix things, and he finally steps back and fiddles with the knobs on his remote. Since I'm so close, I get the feeling that he's angry. I see how important it is to him to give the fans the best show possible. Next, it's Alex's turn. In Witch Hunt, right after the intro, Alex goes to play the opening riff -- but there's no sound. He looks over to his tech. Still nothing's coming out. I can almost feel Geddy Lee's frustration. But then the Witch Hunt riff fades in. As Alex is playing during the song, he looks back over at his tech, who smacks his head in a "D'oh! "-like way. Alex just smiles. By the time the drum solo comes around, the gremlins seem to have been chased away. As always, Neil is amazing -- especially watching from such a close vantage point. In The Spirit of Radio, Randy Johnston comes out with a chicken mask on his head and bastes the chickens in the Henhouse. When he bastes Neil's chicken on the cymbal stand, Neil gives him a smile. I'm happy to hear 2112 Overture and Temples of Syrinx again. Those songs always get the crowd pumped up. Right before the encore, Geddy and Alex throw shirts to the crowd. Just like the last time I saw Rush in this venue during R30, a shirt sails right toward me... and the guy in front of me grabs it. So close. After the show, after getting out of the parking lot, Dan and I somehow made it back to his house in 35 or 40 minutes. I asked him to stop at Wendy's for a burger, as concerts make me really hungry -- especially when I'm air drumming half the time.